History: (What If? I#33/2) - When Doctor Doom and Iron Man were transported into the time of King Arthur, they ended up cannibalizing their armors to build a crude time machine in hopes of sending themselves home. Unfortunately, when they activated the time machine, Doctor Doom chose that moment to strike, teleporting himself back to the present day and leaving Iron Man in the past. As Iron Man crawled from his defeat, Morgana LeFay appeared and reminded him to take with him back to Camelot a promise of vengeance. Iron Man quickly used his remaining power charge to fly back to Camelot and escape LeFay as she was magically trapped within the grounds of her castle. He eventually resigned himself to his fate until Morgana LeFay projected a hologram to him announcing that she had gathered an army of barbarians to attack Camelot. Before King Arthur and his men could battle them, Iron Man flew out in an attempt to scare the barbarians away with the sight of his futuristic armor. The lead barbarian soon managed to grab hold of Iron Man, who flew the barbarian into the sky and threatened to drop him until the barbarian surrendered and announced that his horde would never threaten Camelot again. For his bravery, Iron Man was knighted and given membership into the Knights of the Round Table. As time passed, Iron Man repaired his armor using the available resources and became a local hero in Camelot. Eventually, Morgana appeared once again in holographic form and announced that her son Mordred and his band of cutthroats were waiting to kill Arthur outside the castle. Back at her castle, Morgana monologued her plan to Mordred, explaining that he was to stab Iron Man with a knife forged from a shard of Excalibur itself. When the Knights made their way to Mordred's cutthroats, Mordred succeeded in stabbing Iron Man, whom he left for Morgana to kill at a later date. Arthur had his men pick up the injured Iron Man and when he awoke in Camelot, he found the castle under siege by the enemy. Iron Man immediately set to work on repairing his armor by constructing crude machines using alchemical supplies and days later, Mordred's men succeeded in infiltrating the castle. As Arthur and Mordred battled one-on-one, Iron Man made his jump into the battlefield with a new suit of armor. Despite Iron Man's arrival, Mordred succeeded in fatally stabbing Arthur but with his last ounces of strength, Arthur felled Mordred. As Arthur died, he named Iron Man his successor to the throne of Camelot. Crowned King Anthony of Britain, Iron Man united half the world under his reign and for 1000 years after he left the throne, peace continued on Earth. Comments: Created by Steven Grant, Don Perlin, and Bob Layton. 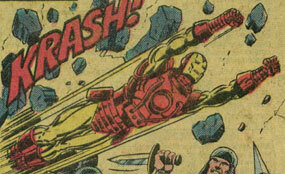 This reality diverged from the events seen in Iron Man I#149-150 (August-September, 1981). 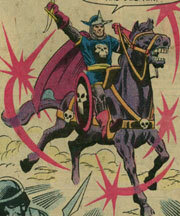 Doctor Doom was the same as his Earth-616 counterpart up until he was transported to King Arthur's time period. 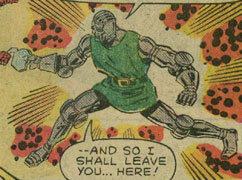 Teaming with the similarly transported Iron Man to build a crude time machine, Doom betrayed Iron Man and transported himself home, leaving Iron Man stranded. Doom, like his Earth-616 counterpart, was extremely talented in electronics and possibly had low-level mystic abilities. Anthony Stark was the same as his Earth-616 counterpart up until he was transported into King Arthur's time period along with Doctor Doom. Teaming with Doom to build a crude time machine, Stark was betrayed and left stranded in the past. Using the last bits of power, Stark became a hero, at one point defeating a group of barbarians sent to attack Camelot by Morgana LeFay. For his bravery, he was knighted and joined the Knights of the Round Table. During an attack by Mordred, Iron Man was stabbed and during his absence while recovering, Camelot was attacked by Mordred's cutthroats. Repairing his armor using alchemical supplies to build crude machines, Iron Man joined the fray in a new suit of armor just in time to see Arthur fall to Mordred's blade. With his last breath, Arthur downed Mordred and announced Stark his successor as king. Under the reign of King Anthony, Britain united half the world in peace that lasted even 1000 years after Stark left the throne. Iron Man's armor granted him superhuman strength, durability, flight via boot jets, and repulsor rays, just like his Earth-616 counterpart. Morgana LeFay was the same as her Earth-616 counterpart up until Iron Man was stranded in her time. She continued her plots against King Arthur and hatched a plan to fell Iron Man and in his absence, take over Camelot. While she succeeded at having her son Mordred stab Iron Man, she didn't count on Stark's technological knowledge. Iron Man quickly re-entered the battle against Morgana, defeating Mordred's cutthroats and even accepting the throne of Britain when Arthur was killed. Morgana LeFay was a powerful sorceress, just like her Earth-616 counterpart. Mordred was the same as his Earth-616 counterpart up until he participated in Morgana LeFay's plot to take over Camelot. During the course of the plot, Mordred succeeded in stabbing Iron Man with a knife forged from a shard of Excalibur itself. 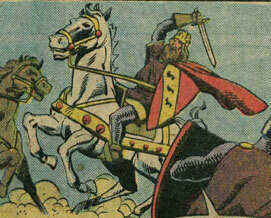 While Iron Man recovered, Mordred led his cutthroats in taking over Camelot, battling Arthur one-on-one. Iron Man arrived in battle in time to see Mordred fatally stab Arthur. Unfortunately for Mordred, Arthur used his last bit of strength to kill Mordred. King Arthur was the same as his Earth-616 counterpart up until Iron Man helped defeat a group of barbarians sent to attack Camelot by Morgana LeFay. For his bravery, Arthur knighted Iron Man and invited him to join the Knights of the Round Table. When Morgana's son Mordred led an attack on Camelot, Arthur attacked until Iron Man was injured, at which point Arthur ordered the Knights to retreat. Days later, Mordred's cutthroats seized the castle and Arthur battled Mordred one-on-one until Mordred fatally stabbed Arthur. With his last bit of strength, Arthur killed Mordred and announced Iron Man as his successor as king.